I absolutely adore my stroller. It is a +phil&teds Jogging Stroller. It can be a 1 seated stroller or a 2 seated one. It is lightweight. Its easy to push. Its divine! The only problem...not much storage space. So I have devised a little stroller caddy to help with the storage issue. This tutorial will also work for umbrella strollers and a shopping cart if needed. 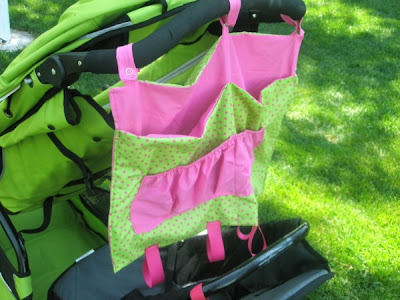 The caddy features easy snaps to attach the stroller handle bar. Also, large pockets so that you can take whatever you need! It even includes little loops to hook toys to for the little one riding in the back of the stroller. Pockets with elastic so that your stuff doesn't fall out when you are running around. Super important! front seat. This is where my baby sits. So I put the ribbon rings at the bottom so that I could attach toys to it. It will help to keep her entertained. Measure how wide you want your caddy to be. Mine was 21 inches. Cut 2 pieces of fabric the width and length that you would like. I had two different colors that I was working with. Cut a piece of fabric 5 inches smaller than your width measurement. Mine was 21 inches so I cut mine 16 inches. So cut the piece of fabric 16 (or whatever your number is) by 6 inches. Cut 2 strips of fabric 1 inch wide by 24 inches. Sew those two strips together and turn and press. Cut into 3 equal pieces. These are for the straps that attach to your stroller/shopping cart so if you would like them longer then cut them longer. Cut your ribbon into 4 equal strips. Heat seal the ends to prevent fraying. (I use these to attach toys to for my baby to play with. 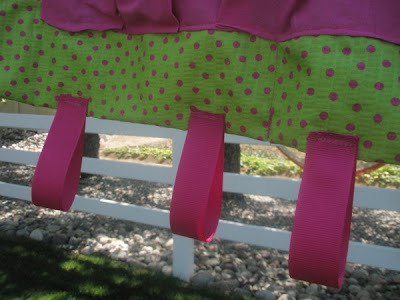 Turn you big pieces of fabric right sides together and pin your straps in the proper place. Sew around and make sure to leave a big enough space to turn it right side out. 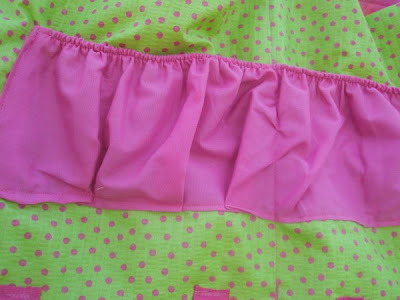 Take the elastic and sew it across the top part of your smaller piece of fabric as close to the top as possible. While sewing stretch the elastic as much as possible to create the gathering. Turn the elastic under and sew. Repeat again so that you have no raw edge showing. Attach the piece of fabric to the larger piece of fabric and turn the raw edge under as you are sewing it. Fold over the big piece of fabric leaving an inch or two space at the top. Sew down the sides to create one big pocket. Sew down the middle to create two pockets. And now you have a fun shopping cart/stroller caddy. 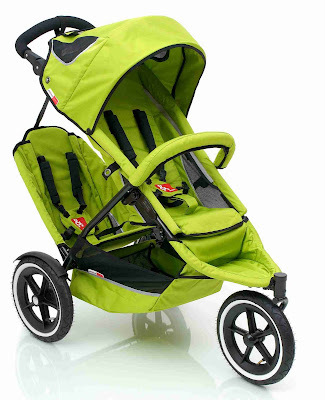 This would work great with a phil and teds stroller, an umbrella stroller, a jogging stroller, and a shopping cart. If you have any other uses for it, it would be great to hear from you. Another idea I have is to make this into an apron. The only thing that you would change is to make straps to go around the waist (or you could use ribbon). I tried this on my 3 yr olds waist and it would fit perfectly (could be a few inches shorter). I just need to make it for her. Such a great blog!!! I love your cart caddy!!!! Thanks for adding it to the blog roll over at Blue Cricket!!! My daughter's having a baby in February. To bad I don't sew. This is a few years too late for me, unfortunately. But would be a great gift idea! Thanks for sharing. I've posted a link. Very cute! I love the idea. 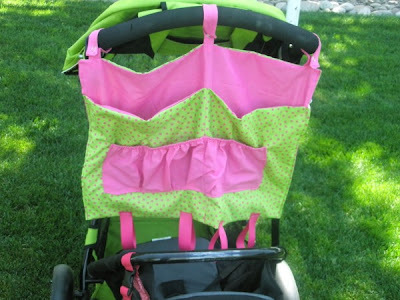 What a fabulous idea, my 2 are done with strollers but this would make a great shower gift for some of my girl friends. Adding this to my idea file! Fabulous idea. Looking forward to seeing you at Creative Jewish Mom next week. great idea and nice tutorial - off to check out some of your other ideas!!TFS! What a cute little carrier! I need one of these! Awesome idea! I have the same Phil & Ted's stroller and am always looking for some more storage! This is an incredible idea! I think I need a boy one for our stroller! :) Thanks for linking up! I love it! It's functional and the colors you chose are so bright and cheery! Thanks for sharing. Great idea. Don't you just love how compact your stroller is for a double? I wasted so much money on other strollers. Such a good idea! I made something similar for my little boy's pushchair but it didn't have so many useful pockets. The colours you've used are lovely.